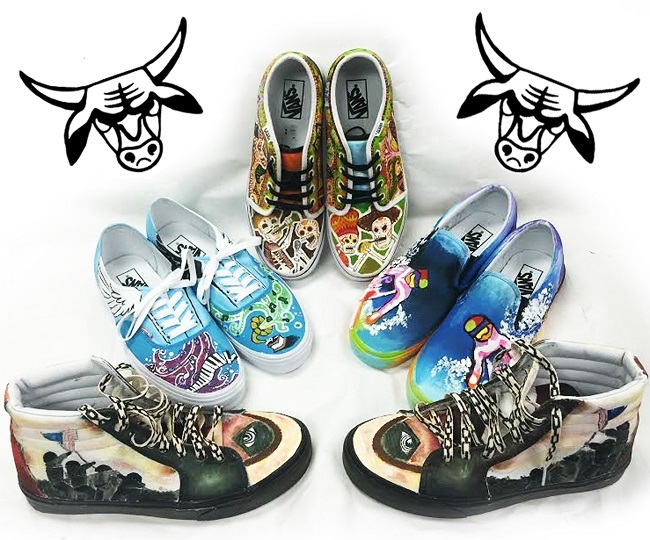 Five Diamond Bar High students are currently ranked top 10 in the Vans Custom Culture contest. They are looking for your votes to push them to the top. The national high school competition invites students to show off their creativity. Vans sent four pairs of blank white shoes to the first 3,000 schools that registered for the contest. The designs of Sophia Arnold – junior, William Chen – junior, Star Vasquez – senior, Mary Zhuo – freshman, and Connie Mach – junior, made the cut. “I love teamwork and being creative with a group,” Vasquez said about the design project. Students customized the popular kicks around the themes Art, Music, Action Sports, and Local Flavor. “Some students have different strengths and they pooled those talents together in the final stages of the process,” Haprov added. Check out the DBHS designs and cast your vote at http://sites.vans.com/customculture/vote/. Voting ends on May 11. “If everyone in Diamond Bar and Walnut cast one vote with their phone and one with their computer, that would be a lot of votes!” added Haprov. The top five finalists will be flown to the finals, where a grand prize winner will be announced. The lucky winner will receive $50,000 for their high school art program and a chance for their designs to be sold in Vans’ retail stores. Runners up receive $4,000 towards their schools. 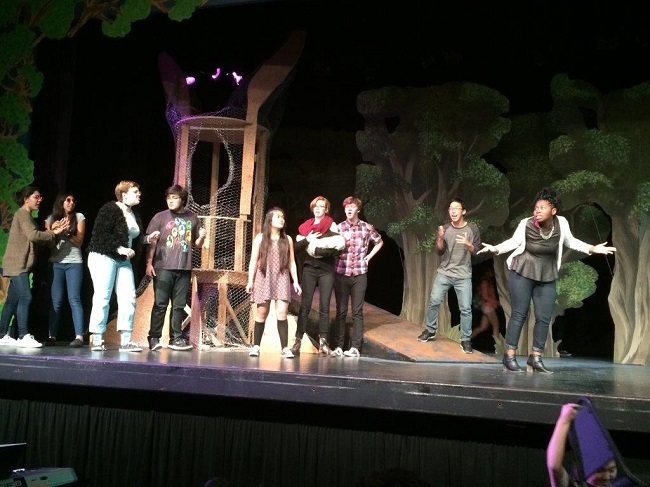 The Diamond Bar High School Theater Arts Department will be performing “Into the Woods” on April 23, 24, 25, 30 and May 1 and 2. All shows begin at 7 p.m.
“Into the Woods,” a musical with book by James Lapine and music and lyrics by Stephen Sondheim, takes a grown up twist on several Brothers Grimm fairy tales, including Red Riding Hood, Cinderella, and Rapunzel, intertwining the plots of several stories with the original story about a baker and his wife, their wish to begin a family and their interaction with the witch who has put a curse on them. The plot depicts consequences of the characters’ wishes and actions. “My favorite part of the production is definitely the musical score. The music is so fun and catchy, and I’m having a lot of fun working with the cast to perfect it,” said DBHS student Will Nazareno, who not only plays the role of Rapunzel’s Prince but is also Assistant Music Director. As is the practice in the DBHS theater program, students involved with the musical, take a production class and work as a company on every element of production including production management, acting, stage-craft, set design, makeup design, publicity, fundraising, house management, box office, concessions and music. The musical features live music played by DBHS’ Grammy Award winning orchestra conducted by Steve Acciani. The visually stunning set was designed through collaboration between staff and DBHS Theatre Performing Arts Academy students. The idea of using books to represent each story came from a set design project by senior Marissa Kummerman and the basic lay out and idea to use trees for all the structural set elements came from a design by senior Emily Beard who also designed and built Milky White, the prominently feature cow in the show. “The aim of the program is to give students real world experiences and skills that will give them a really strong base for college and career,” said Beatrice Casagran, DBHS Theatre Arts teacher. “I’m very excited to be a part of this production. We’ve been putting in a lot of work to make it great, and I can’t wait to put it on for an audience,” said Amelia Anijielo, who is playing the Witch. Though only a freshman, Anijielo has been wowing those who experience her strong, warm mezzo voice and magnetic stage presence. She recently won an award for her acting at the Fullerton High School Theater Festival as part of the DBHS team. Tickets may be purchased online at www.seatyourself.biz/dbhsdrama or at the door. Ticket prices vary depending on seating section, starting at $12 for students and $15 for adults. The Diamond Bar High School Theater is on 21400 E. Pathfinder Road in Diamond Bar, CA. Senate Minority Leader Bob Huff (R-Diamond Bar) is authoring a number of education reforms designed to give California students the best possible education that the state can deliver. His education reform agenda includes measures that address problems highlighted by the recent Vergara v. California ruling and other measures designed to put students first. * SB 279 – Teacher Evaluation Study<http://leginfo.legislature.ca.gov/faces/billNavClient.xhtml?bill_id=201520160SB279&search_keywords=>: This bill would require the California Commission on Teacher Credentialing (CTC) to develop recommendations for the Legislature on how to evaluate certificated employees by using multiple measures that also include student achievement. This report will be due to the Legislature by January 1, 2018. * SB 381 – LIFO Exception<http://leginfo.legislature.ca.gov/faces/billNavClient.xhtml?bill_id=201520160SB381&search_keywords=>: Senator Huff’s legislation seeks an amendment to the Education Code to allow for an exception to the Last In First Out (LIFO) hiring rule. This includes, but is not limited to, those who teach career pathway/Career Technical education courses or any course necessary for the Local Education Area to implement its Local Control Accountability Plan. * SB 597 – District of Choice<http://leginfo.legislature.ca.gov/faces/billNavClient.xhtml>: Extends the 22-year running School District of Choice program, which fosters public school choice by allowing parents to transfer their children to participating school districts without a transfer agreement. * SB 416 – Ensuring Local Control in Schools<http://leginfo.legislature.ca.gov/faces/billNavClient.xhtml?bill_id=201520160SB416&search_keywords=>: This bill removes sections of law in the Education code that were made obsolete from the enactment of local control funding reforms. In order to ensure California closes the chapter on “strings attached” education funding, it is critical these antiquated laws are omitted. Nicholas Lee, 11, of Caryn Elementary School, center, raises his hand in victory. A fifth-grader from an Alta Loma school will represent the region in the Scripps National Spelling Bee after out-spelling 33 other hopefuls Saturday at the 8th annual Inland Valley Regional Spelling Bee at Mt. SAC. Nicholas Lee, 11, of Caryn Elementary School in the Etiwanda School District clinched victory by spelling the uncommon word, “sinecure,” defined as a job or position in which someone is paid to do little or no work. “I didn’t think I’d get into the top 10,” Lee said as he posed for photographs next to a massive trophy. Cheering Lee on from the audience were his parents, Johnny and Gina Lee, and older brother Michael Lee. Gina said she encouraged her son to enter the spelling bee to build his vocabulary and be better prepared for SATs. “I’m very proud,” the mother said. 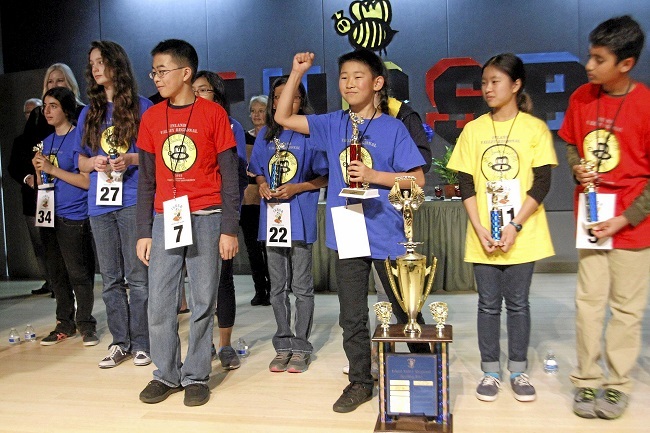 The event was Nicholas Lee’s first regional spelling bee. In second place after a neck-and-neck spell-off with Lee was 12-year-old Brandon Lam, a seventh-grade student at Edgewood Middle School in the West Covina Unified School District. Only the first-place winner will go to Washington, D.C., in May to take part in the nationals. The second-place winner earned $300 and a trophy, and the nine other top spellers received $50 and trophies. Each student who competed Saturday was the champion of their respective school. Read more in Brian Day’s story BEE. Diamond Ranch High School has appointed veteran athlete and accomplished college and high school coach Jimmy Welker as its new head football coach. The Pomona Unified Board of Education approved Welker’s appointment during its March 3 meeting. Welker – an avid four-sport athlete who earned multiple varsity letters in football, basketball, baseball and track and field while at Notre Dame High School – has been coaching football for the last six years. 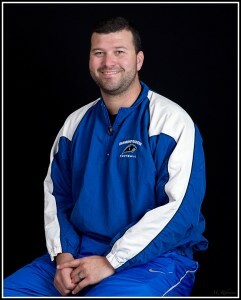 He will begin serving as Diamond Ranch’s head coach immediately. Welker, who holds a master’s degree in sports management from Jacksonville State University, launched his coaching career at University Lab High School in Baton Rouge, La., as the co-offensive coordinator and quarterback coach in 2008. His numerous coaching positions include: outside linebacker coach and junior varsity defensive coordinator at Notre Dame High School; wide receiver coach for the United States Coast Guard Academy; a graduate assistantship with Jacksonville State’s football team; and, most recently, quarterback and defensive line coach at Redondo Union High School for the last two football seasons. Throughout his coaching career, Welker has helped more than 50 young men accomplish their goal to play football at both the collegiate and professional levels. In addition to his achievements as a coach, Welker is a stellar athlete. After graduating from high school, he was offered the opportunity to play quarterback at Louisiana State University, reaching his goal to play at a Top 25 National Collegiate Athletic Association (NCAA) college football program. During his college football career, the team boasted a win-loss record of 43-9 and included LSU’s clenching of the 2007 College Football National Championship over Ohio State. Welker played quarterback in the Arena Football League for the Tulsa Talons in 2009 and the Bossier-Shreveport Battlewings in 2010, accomplishing his goal to play football professionally. Sophomore Madison Landi will be performing with the LA Opera in their production of Noah’s Flood. She earned the role of “Gossip 2”. The performances will be March 6 and March 7 at 7:30pm. CLICK HERE for the website of “Noah’s Flood”. Other highlights of Madison’s young singing career include performing at the House of Blues in Anaheim and at The Grove of Anaheim with her band “Matsune”. She has also worked at Disneyland as a singer. In addition to her singing, she is in Diamond Bar High School’s Advanced Drama class. For the past seven seasons, LA Opera has been honored to work with the Cathedral of Our Lady of the Angels in Downtown Los Angeles to present free, large-scale community performances that have included Jonah and the Whale, Noah’s Flood, Judas Maccabaeus and The Festival Play of Daniel, all under the baton of James Conlon. These community opera performances include singers, actors and orchestra members from the community, performing alongside professional soloists and orchestra members from LA Opera. For the 2014/15 season, LA Opera is reviving its successful production of Benjamin Britten’s Noah’s Flood (Noye’s Fludde). Conducted by James Conlon, LA Opera’s Richard Seaver Music Director, Noah’s Flood will be performed at the Cathedral of Our Lady of the Angels on Friday, March 6 and Saturday, March 7, 2015 at 7:30pm. Walnut Valley Unified has agreed to refund some athletic fees charged to students and families at Diamond Bar High School. The action comes after a formal complaint was filed by Kevin and Beth House with the California Department of Education. The department agreed with the Diamond Bar family that fees charged in the football, wrestling and baseball programs were impermissible under state law. In its rulings, the CDE notes that participation on a high school football team is an educational activity that must be free. If participation in a summer football camp is a condition of participation on the school’s football team during the regular school year, then the summer camp must also be free. It disagreed with the district’s conclusion that the summer camp was recreational rather than educational. The district also claimed the $100 payment for the camp and the $135 required for camp clothing and accessories were voluntary donations. But, the state found that while the 2014 summer camp form changed the word “fee” to “donation,” the camp was nevertheless described as “mandatory” and students were informed that in order to receive their uniform for camp, they must show proof of payment. “A reasonable parent would believe that paying for and participating in the summer camp was a condition of participation on the team during the school year,” the CDE concluded. But the CDE found that since the summer wrestling camp was not a condition of participation on the wrestling team during the regular school year, that fee was permissible. The House complaint also addressed “spirit packs” bought by students. Walnut Valley said the spirit packs weren’t required purchases. It said it provides all necessary uniforms for football, wrestling and baseball, whether a uniform package was purchased or not. The CDE determined that the evidence showed that in order to receive their football, wrestling and baseball uniforms, students were instructed to show proof of payment in violation of the Education Code. It noted that the availability of a fee waiver does not make the fee permissible. Football’s summer spirit pack totaled $155, while the season’s spirit pack cost $222 for varsity players and $195 for other players. Wrestling spirit packs cost $100, $250 for new players. The Houses also paid $125 for a baseball package. The CDE ordered the district to refund money paid for football, wrestling and baseball spirit packs from May 15, 2013 through May 15, 2014. The House complaint also asked for a ruling on working bingos to raise money for the athletic teams. Football parents are asked to work bingo or donate $50 to “opt out.” The wrestling team asked for a opt out fee of $100, while the baseball team requested $100 to opt out each night or $200 total. Walnut Valley said teams are allowed to solicit voluntary donations and that bingo participation is strongly urged but voluntary. The Department of Education decided the evidence shows that parents were required to work bingo or pay an opt out fee as a condition for a student to participate on the football, wrestling and baseball teams. Therefore, participation in bingo fundraising was not voluntary in violation of the education code and any opt out fees were impermissible. It ordered Walnut Valley to refund any bingo opt out fees from May 15, 2013 to May 15, 2014. When the ruling was made at the end of September, Walnut Valley was given until Nov. 30 to remedy the situation, but the district decided to seek “clarification” first. “It was important that we clarified this issue with the California Dept. of Education (CDE) because this is an important policy question facing most school districts in California and we wanted to make sure that we were appropriately and effectively implementing the law,” said Assistant Superintendent of Human Resources Michelle Harold. “With this guidance from CDE, we are taking several affirmative steps to change our policies, our practices, and our personnel’s approach to implementing the fee issues,” Harold explained. On Dec. 12, Superintendent Robert Taylor sent out a letter to parents to offer refunds. He said the district will fully reimburse parents and students for the refunds ordered by the state. Families must submit the refund form provided by the district by Jan. 23. Parents must also submit proof of payment, either a cancelled check or other evidence of payment. If Walnut Valley doesn’t receive a form by Jan. 23, it will consider any payments to be a voluntary donation to the athletic programs. Many parents need help with strong-willed or out-of-control children. Rowland Unified’s Parent Project will offer 30 hours of free training over a 10-week period, beginning Jan. 20. It even provides baby-sitting. Families can catch a preview Tuesday at 5:30 p.m. at Alvarado Intermediate School in Rowland Heights. They can learn about the topics that will be covered in the 3-hour classes held on Tuesday nights starting at 5:30 p.m. Topics include recognizing drug and alcohol use, gang involvement and threatening to run away, among many other subjects. “We help frustrated parents understand that help is out there. That they can change their teen’s destructive behavior for the better, “ said Irma Almanza, a community liaison for the local school district. Over the past 27 years, the Parent Project has worked with 500,000 parents to create this special course, which uses UCLA self-help support group model. It has developed no-nonsense answers to many of the tough questions that local parents face. Naturally, this doesn’t happen overnight, which is why the classes are held over two and a half months. And parents have to do their homework if they want to change things at home. So where do distraught parents start? Experts say love and affection are the keys to effective parent-teen communications. Often, fathers have a problem expressing their love, which needs to be done on a daily basis. Three words, “I love you,” can work wonders. Read more in Rich Irwin’s story PARENTS. 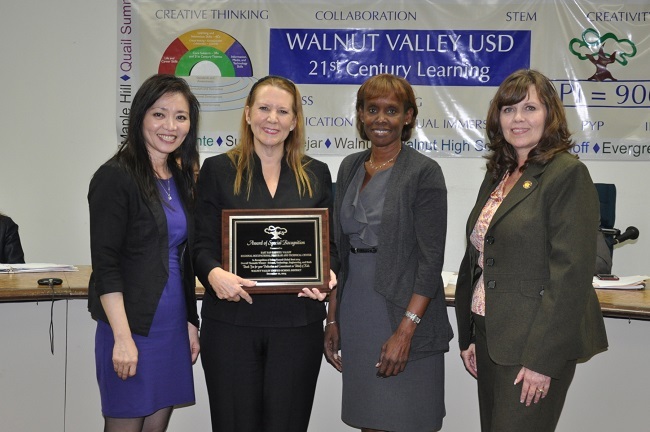 Walnut Valley Unified gave East San Gabriel Valley ROP special award. Chief Financial Officer Josephine Quach, Deputy Superintendent Kim Case with WVUSD Board Members Helen Hall, and Cindy Ruiz. The Walnut Valley Unified School District presented the East San Gabriel Valley Regional Occupation Program and Technical Center with an Award of Special Recognition during the December Board Meeting. “We’re very fortunate to work very closely with the East San Gabriel Valley ROP. Our students and community benefit a great deal from this partnership,” said Superintendent Dr. Robert Taylor. ROP recently won two worldwide awards: Global Best in North America for 2014 and Overall Science, Technology, Engineering, and Math (STEM) Program. This summer, Board Member Helen Hall flew to Brussels, Belgium to attend the awards ceremony with ROP Superintendent Dr. Laurel Adler. “We’re very grateful for the time and energy Helen spends representing us,” said Board President Cindy Ruiz. They met people from the other countries that were nominated including Africa, India, Finland, Scotland, Germany, South Africa, and Canada. “We all spent several days exchanging information from our very different programs. And we didn’t know who would win until the awards night,” Hall said. Deputy Superintendent Kim Case and Chief Financial Officer Josephine Quach were on hand to accept the award during the WVUSD Board Meeting. “Thank you for your passion for all students and the programs that you create,” Hall said. “The key is to keeping kids in school. ROP has a 13th Year Program for students who are not sure when they finish high school. They can go to ROP, take classes, get focused, and really move in the right track. It’s an amazing program and I’m glad our students benefit from this,” she stated. Hall also serves as a Board Member for the ESGVROP. The highlight of the Brussels trip was meeting a young lady from NASA who worked on the Orion spacecraft, Hall explained. And WVUSD is very excited to participate! upside-down rubber band catapult pushed a spinning ball to the top of a 20-foot rain gutter ramp. Congratulations to Chaparral Middle School sixth grade students Karissa Wong and Joshua Chou who won top awards in the “Keep it Moving” Jet Propulsion Lab (JPL) Design Competition. The team brought home a 4th Place award at the regional contest last year and advanced to the finals. The Chaparral students competed among 20 teams at the finals. Most were at the high school level, but that didn’t stop these determined middle school students. Wong and Chou won 3rd Place and the Most Creative Design awards. 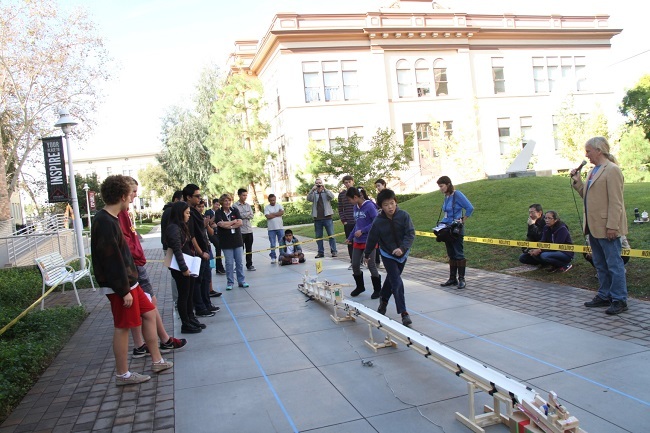 The objective of the Keep it Moving challenge was to invent a device to move a billiard ball between five to eight meters using three modes of transportation – gravity, any sort of spring, and a free choice of energy like a motor. They designed an upside-down rubber band catapult to push the ball up to the top of a 20-foot long rain gutter ramp. The ball had to be kept moving (spinning didn’t count) the entire time during the contest. The billiard ball rolled down the ramp by gravity until it was blocked by a servomotor arm, which moved back and forth to keep the ball moving very slowly for timing accuracy. At a specific time, a computer commanded the arm to open up to let the ball continue to roll down and hits two triggering switches to turn on loud buzzers. The entry also needed to initiate an audible sound as close to 20 seconds as possible, by the ball. The Chaparral students clocked an impressive 20.218 or 0.218 second over the 20-second mark! “We liked the meetings and practices at Chick-fil-A best!” the pair exclaimed.